(Nanowerk News) A Florida International University professor and his team this month published news of a scientific breakthrough that could lead to the noninvasive treatment of Parkinson’s and other neurodegenerative diseases. 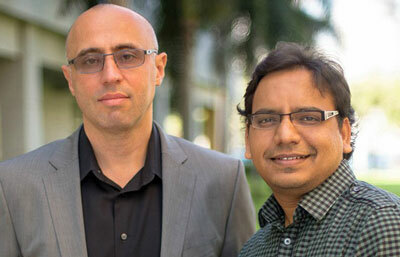 Sakhrat Khizroev, left, with a member of his lab, researcher Rakesh Guduru. The journal Nanomedicine is featuring the paper ("Magnetoelectric ‘spin’ on stimulating the brain") by Sakhrat Khizroev, a professor with dual appointments in the Herbert Wertheim College of Medicine and the College of Engineering & Computing. Using a previously reported FIU-patented technology, researchers began by intravenously administering magneto-electric nanoparticles, or MENs, in mice. With a magnet placed over the head of each subject animal, the particles were pulled through the blood-brain barrier, where they “coupled” the externally created magnetic field with the brain’s intrinsic electric field. This enabled researchers to wirelessly connect their computers and electronics to neurons deep within the brain.